Hole 1 – “Norwegian Wood” – a gentle 340-yard, par-4 named for Ringo Starr’s favorite club, his Norwegian wood—a custom-made version of a late-1960s-era 2 wood. Hole 3 – “Let it Be” – a testy par 4 with vicious, environmentally protected blue-meanie grass lining both sides of the fairway. Course rules require abandoning your ball with a one-shot penalty unless your name is Jeremy. Hole 7 – “Strawberry Fields Forever” — a demanding 225-yard par-3 that requires a long forced carry over an heirloom strawberry patch. If you hit into it, you are guaranteed to take forever to get out. 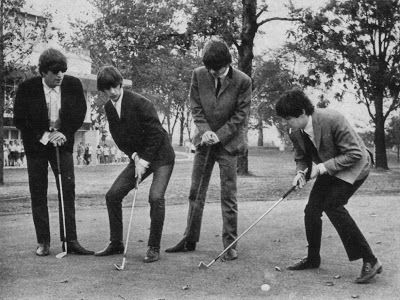 Hole 9 – “Sea of Holes” – this 540-yard par 5 features a green with 12 holes cut into the putting surface, one for each of the original studio albums released by the Beatles. You must hole-out here, there and everywhere before proceeding to the back nine. Hole 13 – “Ono!” – Originally named “Hello Goodbye,” this short one-shotter of just 127 yards has an island green just 909 square feet in size, making getting on in regulation tough. Wayward tee shots so often resulted in exclamations of alarm that the hole was renamed “Ono!” in 2011. Hole 17 – “The Long and Winding Road Hole” – a dogleg-right requiring a deft tee shot over the corner of a yellow submarine pen. Stray too far to the right with your second shot and you’ll have to play your ball from the zebra crossing of a local road congested with frenzied photo takers. Hole 18 – “The End” – It’s the course’s most straightaway hole, but for some reason foursomes are unable to finish playing it together.